Post Bird Feeder poles have Raccoon baffles below to block Raccoons from climbing up the pole. 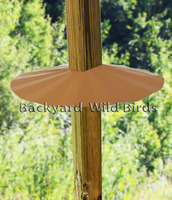 These 4x4 Post Bird feeder pole baffles make Raccoon and squirrel proof Bird Feeders above them. 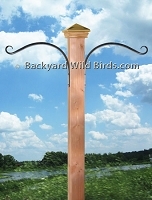 Bird Pole Post 12" Hanger Arms is a pair of bird feeder curved hanger arms. The post or wall hanger arms are hand forged square steel stock with a 12" reach. 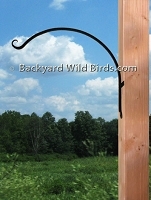 Bird Pole Post Curved Arms is a pair of 18" bird feeder hanger arms. Wrought iron arms work great to mount bird feeders and hanging plants. 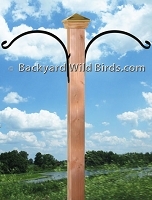 Bird Pole Post Hanger Arms is a pair of 12 inch bird feeder angled hanger arms. 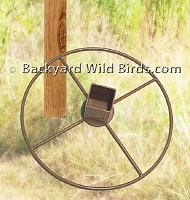 Works great on a 4 x 4 post or wall to mount bird feeders and hanging plants. 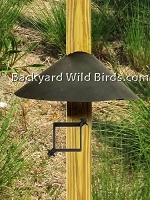 Post Cone Squirrel Baffle is a squirrel deflector for a standard 4 x 4 post that includes a post mounting clamp. Post baffle wraps around post. Post Ground Screw for a standard 4 x 4 Post is an excellent way to mount and install a post into the ground. 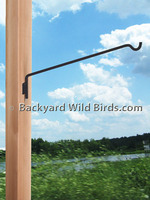 Wall Bird Hanger Arm Bracket is a 24" long wrought iron bracket with an upturn hook. 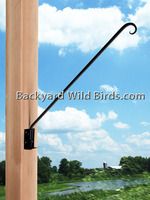 Strong 7/16" square bracket can be use to hang bird feeders or hanging plants. Wall Heavy Duty Hanger Arm is a 24" long heavy duty reinforced 7/16" wrought iron bracket with twist before hook . The Reinforced 3/8" bar provides unparalleled weight capacity of 40 pounds. Wrought Iron Fixed Arm Bracket is a 20 inch heavy duty hanger arm. 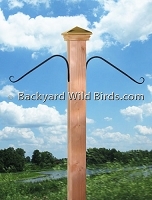 The angled Hanger Arm Bracket is perfect for bird feeders and hanging plants. The wrought iron bracket arm can be used as wall, deck, or post mount. Wrought Iron Swivel Arm Bracket is a 32 inch Swivel Hanger arm. 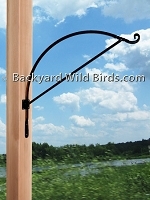 The Swivel Arm Bracket is perfect for bird feeders and hanging plants. This bracket is heavy duty wrought iron arm that can be used as wall, deck, or post mount.